Never worry about low light conditions affecting mission success while equipped with the TLR-3 LED Compact Rail Tactical Gun Mount Weaponlight from Streamlight. Featuring a powerful C4 LED lamp and a ruggedized construction, the weaponlight is built to take on the toughest environments possible. An ambidextrous activation switch allows users to quickly turn on the light from a natural shooting position. 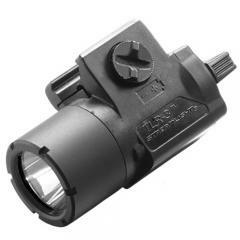 This means that shooters can quickly illuminate dark spaces without having to shift their line of sight from the target area. The tactical upgrade includes six interchangeable keys that allow it to be secured to a wide range of weapons. Its body is made from impact resistant polymer with an aircraft aluminum face cap and can be completely submerged in up to three feet of water and still retain total functionality. The TLR-3 fit perfectly using one of the included keys under my Walter PPQ M2 9mm. Its easy to reach, easy to engage, and is capable of lighting up the room. It is all that I hoped it would be. I would recommend it as a fine value. He adapters are kind of weird, but great light, fits perfectly on my full size .40 M&P and a great price. The Streamlight TLR-3 LED Compact Rail Tactical Gun Mount Weaponlight delivers a bright 90 lumen light from a C4 LED at a compact size. Rob Pincus discusses the use of a weaponlight vs. handheld flashlights and review the Streamlight TLR-3 weaponlight.